The instruments CASI, TASC and TTS present the high end range of scatter measurement devices presented by The Scatter Work, Inc. Each of them has unique advantages for specific challenges within the customers’ applications. The CASITM Scatterometer is used for incident plane scatter measurements with an option for polarization control. The CASITM was developed to provide reflective and transmissive scatter measurements very near the specular beam as well as at high scatter angles. The noise floor is limited by scatter from air molecules, but it also measures right through the specular beam. 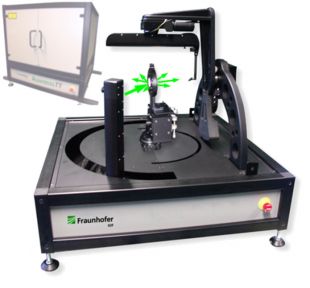 The TASCTM Scatterometer provides unsurpassed versatility in hemispherical scatter measurement systems. The polarization transformation option allows measurement and analysis of Stokes vectors and Mueller matrices. The retro-scatter assembly option provides sensitive measurement of energy scattered directly back along the incident beam. The new Table-Top 3D Scatterometer TTS, developed at the German Fraunhofer Institute (IOF) in Jena, enables laser-based highly sensitive measurements of angle resolved light scattering, reflectance, and transmittance of optical and non-optical surfaces, materials and components within the entire 3D-sphere. For more information and an official quotation, please contact our sales team at info@sphereoptics.de or by phone.